You know how sometimes you are thinking about one thing and then you find yourself wandering down paths far from the original topic? Maybe it’s just me … I was thinking about how once in awhile Tom would call me “girl” and how that was probably the only time I liked the label. But then I started thinking how at fifty probably no one would ever think of me as a girl or call me that. And then I started thinking about things that I shared with my ten year old self. So the first thing that came to mind was my love of reading. I’m not sure when exactly I became obsessed with reading, but I remember distinctly having thoughts about not wanting to play with friends because I wanted to read. I also remember taking a book with me while trying to climb trees because I just didn’t want to stop reading. This past Friday I had a serious conversation in my head about whether I was going to go socialize with my friends or stay home and read. And on Monday I changed the sheets on my bed with a book open on the night stand so I could read a few lines every time I got close. That’s pretty darn similar behavior! Ten year old me and today me are pretty identical in that way. What else? I always loved to have long conversations with my mom… And I’m still a big fan. My love of chocolate was well formed as a girl… my preference for Hershey’s special dark chocolate and Baskin Robbins chocolate fudge ice cream definitely started when I was young (though my favorite chocolate candy brands have changed). I still have all the freckles that I acquired in childhood and the silly cowlicks that make my hair so aggravating. Ten year old me lives on in a lot of ways. Fortunately experience has wrought some changes. As a girl I was very fond of rules and making sure everyone followed them. I spent six months sitting out at recess because I couldn’t play kickball with my class without getting angry at everyone who was “cheating”! I like to think I’m much better at letting others figure out how they want to live without my interference. And hopefully I see that there are a lot of different rules out there. It doesn’t always have to be three strikes and you’re out. It could be four or five strikes instead! As a child I felt shy. I was jealous of my little brother who always seemed to make a bunch of friends instantly no matter where we went. As an adult I think I’m a little better at being friendly and reaching out to others. Apart from some obvious opposites, I think the child I was has gradually grown into the woman I am… Life experience has taught things that ten year old me couldn’t imagine. In many ways we aren’t much alike. But hopefully the girl I was would be happy to see how we turned out! Someone asked me recently if I ever dreamed of Tom. Off hand I would have answered that I really didn’t. I would have guessed that I’ve only had a couple of dreams of him in the four years he’s been gone. And really, I never dreamed of him when he was alive, so nothing new there. But I’ve been writing to him pretty regularly over the past four years, and when I’m feeling particularly masochistic I have been known to go back and read what I have written. Given, there are tears – but there are also clear indications of healing. And, pertinent to this bit of writing, there are a lot of references to dreams of Tom. Like, maybe twenty or thirty occasions where he appeared in my dreams. My reality is actually a lot different than my remembered impressions. I’ve been thinking how this relates to faith in Jesus Christ. For Christians, having an experience of spiritual enlightenment or recognizing an answer to a prayer or feeling God’s love are all ways in which our faith in Christ grows. But just like my impressions of my dreams, experiences with the Holy Spirit have a way of slipping away. In the moment, I am sure of the reality of God. But time and life have a way of making me doubt those experiences. Over and over in the scriptures we find the counsel to remember God. The law of Moses was full of actions and clothing and rites all designed to help the children of Israel remember God daily. And my experience with faith makes it clear why God puts such emphasis on remembering. I can’t just have a spiritual encounter with God and then go on my merry way and expect it to stick. I have to remember it and ponder on it and let it change the way I live my life. This is a place where journal writing comes in handy. There have been dark days when I have felt alone and unsure … and how grateful I have been to pull out an old journal and read of some of the times I have felt God’s hand in my life. It has reminded me to trust Him and not lose hope. And just like my experience with dreaming of Tom, I have been surprised to see just how often God reaches out to me and invites me to believe in His Son and His great mercy and strength. When I begin to think that I never have “faith promoting” experiences, a quick scan through my journals reminds me that my reality is very different than that impression. There are a lot things we can do to grow in faith in Christ – prayer, scripture study, living a Christ-like life – but recording and remembering our spiritual experiences is an important one. In the writing, I articulate what my experience meant and in the re-reading I remember just how God reached out to me. Two weeks ago my brother-in-law passed away unexpectedly. His is not the first death of someone close since Tom died, but it maybe hits a little closer to home, since Richard was relatively young and his death was unexpected. The weekend of the funeral I kept thinking surely there had to be something I could say or do to make things better. After all – what was the point of having gone through the very same thing if I couldn’t somehow help my sister-in-law avoid some of the pain? I know that sounds silly … there’s no magic pill for grieving. Death is an ever present part of mortality and sooner or later we face the loss of someone we love dearly. It will never be easy to face living without that person. But I wanted so much to somehow take away the pain. All I could really do was cry with Joanna and her children and offer lame words of hope that eventually it would be a little easier and reassure her that everything she was feeling was normal. I couldn’t even offer her any magic remedies to make it easier. In talking with widows and widowers, I’ve discovered that grieving is very individualized. While many spend time talking to their loved ones, I have always felt self conscious about that … but I write to Tom pretty frequently. I’ve found comfort in sleeping in the same bed surrounded by all the reminders of my life with Tom – but many find that very reminder too difficult and have to make big changes to move forward. So… the best advice I can come up with is: cry when you need to for as many years as you need to. Be gentle with yourself and don’t expect to feel normal for awhile. Enjoy the moments when you feel happy – because sorrow will still be there even if you find things to smile about. Trust Heavenly Father that He will take care of you even if you can’t see how. It seems like so very little. A wise prophet taught that as Christians we are to be “willing to bear one another’s burdens, that they may be light, yea and are willing to to mourn with those that mourn, yea and comfort those that stand in need of comfort” (Mosiah 18:8-9). I hope at least my experiences have helped me to be a little better at this – to know what it feels like to have someone mourn with me and to be able to do that for my family. Tom and Richard were great friends. I can only imagine their reunion as they shared their own unique greetings and inside jokes. They shared a love of all things BYU as well as time spent out on the golf course. I have Richard to thank for my first married home. Tom and I left on our honeymoon with no place to live but Richard came through in the clutch with our little basement apartment. He and Joanna were generous enough to open their home to us 18 months later – a lucky house where our hopes of conceiving a baby came true. Richard was always ready to lend a helping hand and always made a point of making me feel welcome as I figured out how to fit into this big, loving family I married into. I’ll miss his welcoming smile and hug when I go to Provo to visit family. I know he will continue to take care of his family with the same love and devotion he showed while alive. We’ll miss him. It’s been four and a half years since Tom passed away. Just writing that seems unreal. It is hard for me to believe that he has been gone so long. Much of the grief of his passing has tempered with time. I still think of him almost daily, although a lot of the pain of that remembering has gone away. However, there is one of result of his death that has not really changed – the fact that his death meant I quit being part of a couple. It sounds like an insignificant thing. I’ve always considered myself reasonably independent and in many ways I had to work to rely on Tom when it would have been much easier to just rely on myself. But after 23 years as part of a partnership, it has been eye opening to find myself on my own again. In the beginning, it felt overwhelming to make big decisions. When I had to decide on car repairs, or how to handle a parenting issue, or even if I should spend money on a vacation I missed having that second person with whom to talk it through. There have been good substitutes – I have wonderful parents and siblings and friends. But some things I really am alone on – no one has the same responsibility for my children that I do as a parent. All the well meaning counsel and advice doesn’t have the same weight as counsel from a co-parent who has the same investment that I do. Last weekend I went to an evening meeting for seminary teachers (I’m a volunteer religious teacher for my church). The invitation was for teachers and their spouses. I’m pretty sure I’m the only single teacher in the group right now. I was greeted with enthusiasm and interest when I arrived. Yet, when the lights went out (it was a church-wide broadcast meeting via television) I found myself tearing up. I was surrounded by couples who were together, not alone. They were sharing an experience they could go home and talk about and that would give them yet another thing in common. I used to have that, and while it didn’t seem like a big deal (heck, going to another church meeting wouldn’t have really felt like quality time spent together), in retrospect it was such a big perk of being a couple. In almost every social gathering, I had a safety net. If I didn’t have a friend to talk to and hang out with, I always had Tom. When I just had to get something off my chest but was wary of saying too much, I could always share it with him. He didn’t judge my words too harshly, he would never pass them on, and he often gave me a different perspective. We were “in it” together when it came to parenting, house upkeep, retirement planning, and how to spend our free time. While I do enjoy some aspects of doing these things solo (who doesn’t like having complete control of the TV remote?) mostly the trade offs are a pale substitute for being part of such an intimate partnership. I’m grateful that my life is good … there are so many things that have gone well in my life. And really I’m grateful for all the years that I was married to Tom and got to learn first hand the perks of couple hood. If I’m fortunate enough to remarry, I hope I never take them for granted! In the meantime, I’ll try not to feel too sorry for myself and to focus on being happy for my friends and family who have this gift in their lives. In my school days (and probably long after that!) 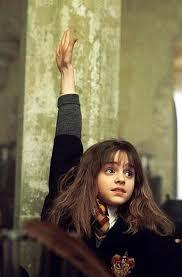 I was a lot like Hermione Granger in that I always had something to say. I wasn’t nearly as smart as she is, but I had lots of opinions and I had to share them. The problem with over sharing is that inevitably you become a pest or worse, you actually hurt people. I probably did a little of both in my younger years. I hope I’m more careful now. If you were one of those people that I annoyed with all my opinions, I’m sorry! And if you were one that I hurt, I hope I have made things right with you. One thing I have learned over the years is how little I really know about anyone’s experience but my own. A few years back a leader in my church gave a talk entitled, “Your Name is Safe in Our Home”. The emphasis was on avoiding gossip or talking unkindly about others. I have found in my own life that it also includes making blanket statements about how things should be. I’m sure in the past I shared things like, “In our family we always do this, so our kids are just turning out perfectly!” It is only as the parent of young adults that I can see how hurtful those comments were to parents who had “always done this” and whose kids were not turning out perfectly. Now I know that child raising is more nuanced – that children are individuals with agency and personality – not some constant in a child raising equation. The question I try to ask myself now is, “will this help or will it hurt?” I’m not obligated to share all my opinions – and I’d be smart not to, because some of them might be embarrassing to admit to in coming years! I’m working on limiting my advice to people who actually ask for it. My kids would probably say I’ve got a ways to go yet. I do believe that sharing our personal experiences can be helpful – but we need to be careful about how we do it. Our experiences are unique and not all lessons are transferable. The words I found most comforting after Tom’s death may not be comforting to someone else who has lost a loved one. The counsel I found most helpful was that which I asked for. The comfort that was most comforting was strangely free from counsel – hugs and expressions of love and a willingness to listen. In the end I hope that I speak more in love now and less to show off what I know. Because really, I just look foolish when I try to be wise. And really, what I want to do is make people feel loved and understood as a result of my words. Roy T Bennet said it, and intellectually I know it, but comfort zones are awfully safe, even if they aren’t always enjoyable. Growing up a Navy Brat, change was an ever present part of my life: new home, new school, new friends were guaranteed every couple of years. Even when I moved on to college, there was still a lot of change going on. Of course I didn’t like everything about it, but moving meant starting over when things weren’t going well. It meant adding new friends to my life. It meant exploring Hearst Castle and eating lobster rolls and finding jelly fish on the beach and spending Saturday mornings watching the gorillas at the zoo. Every place we lived had something interesting to explore and enjoy. Even when I went off to college I moved a lot – a new place to live every year, a summer spent in Germany, 18 months in Spain. It wasn’t until Tom and I moved to Denver in 2000 that I began to put down roots and settle into a life that wasn’t transient. When I was young and thinking about marriage, I could only imagine marrying someone in the military and continuing my life on the move. I thought I would never be content to just stay put. But now I quite like being tied to my neighborhood and my longtime friends and having a history with the place I live. I am grateful that I wasn’t limited to my imagination in creating a grownup world. There is a downside to this stability … over the years I’ve become less open to change. As hard as moving could be, when I was a kid there was always a low level excitement about what was coming next. And what came next might be hard, but it always brought compensating positives. As an adult who is facing the end of yet another stage of my life, I’m much less excited about what is coming next. It feels weird to be reluctant – like I’m not who I always thought I was. But maybe I’m just more experienced. I know that some changes are like tidal waves – they drown and bury and completely change the landscape of a life. I’ve had a few tidal waves come through and strangely they don’t make small changes feel like “no big deal”. On the contrary, every change feels threatening, even when I know with my brain that it’s not. But as John Maxwell says, “Change is inevitable. Growth is optional.” If change is coming anyway, I want to take advantage of it and find the joy and satisfaction that come with effort. So 2019 is my year to move out of a few comfort zones as I figure out what this next part of my life is going to look like. Here’s hoping I can work up a little of that excitement I used to feel when I was a kid! If Facebook is any indicator, November is the month for public gratitudes. My feed is filled with posts expressing thanks for wonderful spouses, loving children, inspiring parents, great jobs, etc. Often the person posting expresses the thought that these blessings help them know that God loves them. One of my favorite books, The Hiding Place, includes a story about Corrie and her sister in Ravensbrück concentration camp. Corrie’s sister reminds her that they need to thank God in all things, to which Corrie replies that she can’t be grateful for the fleas. But her sister prevails and they thank God for the fleas. Later they find that the fleas are what keeps the guards out of their barracks allowing them to share the comfort of the gospel with the other women. I don’t think anyone would feel grateful for any part of a concentration camp and feel that this was evidence that God loved them. But Corrie and her sister did because they were obedient to that commandment to be grateful in all things. So in that spirit, I share a few of the “fleas” in my life. I’m grateful for children who have been challenging to parent … Despite the many tears I’ve shed and the worry I’ve felt, the experience has taught me so much about loving like Christ does, about being patient in afflictions, about forgiveness, about compassion for those who are struggling. I’m grateful for the death of my spouse … Amid the grief and loneliness, I’ve felt the sustaining support of God in the hands of so many of His children who have loved me and mourned with me and supported me. I’ve discovered just how much I love Tom and how much of who I am is because of our relationship. I’ve gained a hard won understanding of how death changes life and how I can better succor those who are also grieving a loved one. I’m grateful for being single again … It has forced me to reach out to others more, to leave my comfort zone and make new friends and try new things. It has made me appreciate the challenges of living without a partner in ways I didn’t understand before. 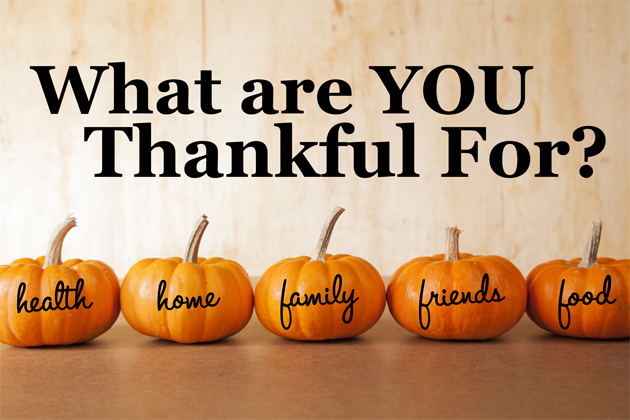 Theses are big things, but I feel challenged to find gratitude in the little things as well. Can I be grateful for a traffic jam? For an obnoxious customer that I have to listen to at work? For a car repair? In this month of Thanksgiving when there are so many good things to be grateful for, I want to try a little harder to be grateful for everything (good and bad). I want to thank God, trusting that He has a plan for my life and happiness even when I can’t see it. Happy Thanksgiving! Since my parents have been serving a mission for The Church of Jesus Christ of Latter-day Saints in Florida, my dad has been publishing a weekly blog post to keep us all updated on what they do each week. I feel like I’m beginning to know all the regular players in their weekly routines and appreciate Dad’s efforts to make us feel included in their adventure. It also makes me feel a little guilty that my posting schedule has become so erratic. I have good intentions, but then I feel like I don’t have anything new to say, so I don’t write … and then I really don’t have anything to say because the less I write the less I want to write. It’s a vicious circle. I’ve been avoiding writing anything this weekend because it is the anniversary of Tom’s death. I have mostly kept the anniversary of his death low key – honestly it’s not a memory I look back on with fondness (that’s the understatement of the year!). But events have conspired against me this year. A few weeks ago Haley attended Camp Erin which is a free camp for children who have lost someone close to them to death. It is a place for peer support – making connections with other kids who share similar experiences. I think overall it was a positive experience. Haley has good things to say about the weekend. But she came home with all those grief emotions stirred up. It is normal for kids to go through regular cycles of emotions as they grow up and reprocess their experiences in a new stage of development. I’ve seen that already with my kids in relationship to their experiences being adopted. But knowing and actually experiencing this reprocessing was challenging this year. Haley was so sad and upset about losing Tom – and feeling guilty for somehow not saving him. These are conversations we have had before but I was reminded again of how necessary it is to keep having them because our brains are funny creatures and can get all confused when we do a lot of thinking and not enough sharing. Anyway, Haley made some good choices in dealing with all these churned up emotions among which was going back to see her therapist. I’m so happy for her that as she is growing up she is learning how to take care of herself in healthy ways. Despite her difficult feelings she is still doing her school work and showing up to work and reaching out to others. This is what I love abut seeing about my kids growing up – they can be responsible for themselves and can work through the hard stuff without running away. Another thing that has come home to me this year is that four years is actually a long time. There are so many big things that have happened since Tom died. Spencer got married and finished college and got a job in his career field and has moved as a grownup. All of those things are huge – and they all happened without Tom’s physical presence in our lives. Andrew spent two years at boarding school and has reestablished contact with his birth parents and has turned 18 and is living out in the world. It’s hard to believe how quickly he went from being a kid to becoming a newly fledged adult. Haley has changed so much – when Tom died she didn’t even wear makeup and was still in Jr. High. Now she’s a senior in high school with a job and a love for changing her hair (I think she is channeling her Aunt Erin!) and a new sense of assertiveness and a soft heart that she guards carefully. I’m on my fourth year of teaching early morning seminary (something I started almost a year after Tom’s death) and I’m one of the old-timers in my pottery class. I’ve been to Mexico twice on vacation. I’ve tiled a fireplace surround and a bathroom shower on my own as well as replacing baseboards in my home – two things that definitely would have been joint projects if Tom were still alive. It’s weird to think that some of these things feel like they happened awhile ago – because that means Tom’s death happened a really long time ago. Despite that, he still feels like a current part of our family. I was talking to my mom the other day and she shared something my aunt commented on. She was part of a conversation where they were discussing siblings who had died at a young age and how the speaker didn’t feel a connection to that sibling. My aunt had a different experience. My grandparents had two boys who both died within a few days of birth. For my aunt and my mother, their brothers were part of the family. My grandparents talked about them and anticipated with joy the day when they would be reunited with them. Even I have fond feelings towards my two “baby uncles” and am illogically pleased that Tom was buried next to them in Monroe. My point is, death hasn’t erased the place Tom has in our family and in my memories and the person I have become. So it always feels odd to realize that so much of the life I have right now is full of things and experiences I haven’t shared with him. The last thing I have been thinking about in connection with this anniversary is the idea of being lonely. I can only speak to losing a spouse – I don’t know the emotions that come with losing a child or a parent. Losing a spouse feels like a unique loss. Of all the people I have relationships with, the relationship I have with Tom is unique. He was the only one to know many of the parts of myself that I keep private from the rest of the world. I told him things that no one else knows. I know things about him that no one else knows. Ours is a relationship that was chosen (unlike most family relationships that we are born into). Tom was the person I went to when the very worst things happened – except when the very worst thing happened, I couldn’t go to him. Having had this relationship, the absence is very lonely. And it isn’t a kind of loneliness that can be fixed with other relationships. I have great friends, wonderful children, supportive parents and siblings. Really, I have been extraordinarily lucky that in the aftermath of Tom’s death, I was surrounded with love and company and inclusion. I have not lacked for people to spend time with. And none of it replaces the marriage relationship. Now, before we all start planning the pity party, let me hasten to add that there has been one compensatory relationship that has grown and improved over the last four years. I may have been dragged, metaphorically kicking and screaming, to this conclusion. I didn’t like to think that it would take such a drastic change to accomplish such a task. And maybe I would have come here eventually anyway. But losing Tom made me turn to God in a way I hadn’t before. As honest and open as I was with Tom, Heavenly Father knows me even more intimately. I can tell him things I couldn’t even tell Tom. And He has been there during those moments when no one could help me, when I couldn’t turn to anyone else. Even when He couldn’t tell me all the answers to all the questions I have had about my circumstances, He could tell me it would be OK and I could trust Him. He has carried my burdens in ways I couldn’t even imagine when I tried to figure out how I would get through something. I’m grateful that in all the overwhelming waves of grief I held on to the lifeline of faith and trusted in Him. My loneliness is tempered with a more meaningful relationship with God and Jesus Christ. That is a pretty wonderful thing to have as I navigate my life on my own. I have no idea where the next four years will take me. I’m definitely on the brink of more big changes – the empty nest approaches! But I’m hopeful … the last four have been good ones on the whole. I’m excited for the future. I was folding sheets this morning. When I was young, my mom taught me to fold fitted sheets – nesting the corners together, smoothing the fabric flat into a rectangle with one rounded corner, before folding it small enough to fit in the linen closet. 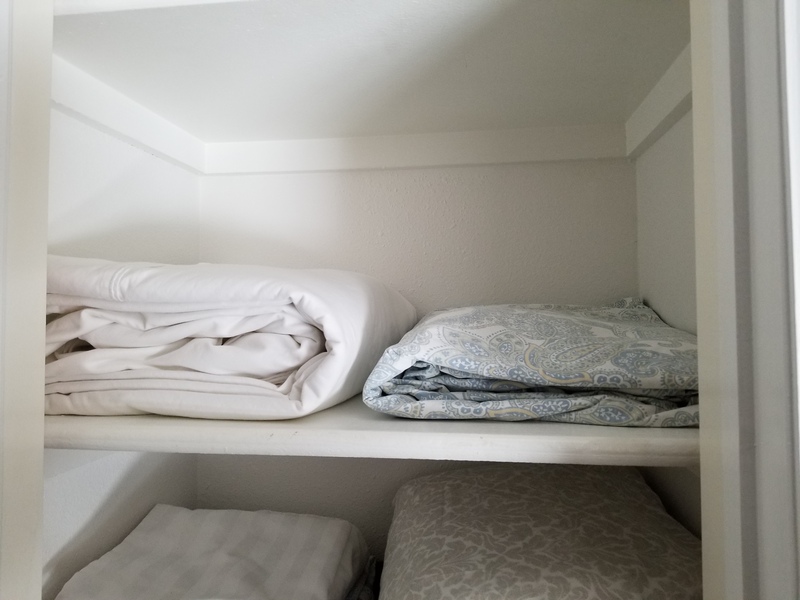 As I have gotten older, the sheet folding process has gotten more exact – I fold the top sheet so that I can wrap it around the fitted sheet & pillowcases making a handy little bundle that fits exactly on my shelf. It’s a little ridiculous, frankly. No one sees my linen closet. I could wrap the whole thing in a rumpled bundle and no one would know or care. It got me thinking about why I do it – and any number of other things that I do in such exacting ways. The honest truth is that I like order. It doesn’t have to be exact, but I like things to have their place and look purposeful. The first time I can remember really caring about this was in college. I would come home from classes, ready to study, and find myself distracted by the unmade bed and the clutter on the floor. I couldn’t get down to business until my side of the room was picked up. Funnily, it didn’t matter how the other side of the room looked – I just needed my realm of influence ordered. I care for the things around me because of how it makes me feel. I like looking at the neat bundle of sheets on my shelf. I like the way the fabric is all smooth when I unfold them to make my bed. I like opening my spice drawer and seeing all the matching labels or knowing which drawer holds tupperware and only tupperware. In a world where I sometimes imagine that anything could happen, creating order gives me the illusion of control. On the upside, order means I have more brain available for the unordered parts of my life. gloves, and trash bag I headed out. We have these terrible thistle weeds that are super invasive and hurt like the dickens when you pull them out. We’ve always had a problem with them, but I kind of neglected the yard in the first couple of years after Tom died, and they got a real foothold in the grass. Last year I covered all the empty flower beds with black plastic and that really helped reduce their numbers in those beds – but the lawn seems to be the perfect environment for them to flourish. Walk barefoot on my lawn at your own peril! Anyway, I started listening to an audio book, but it wasn’t long before the neighbor girls (twins – about seven years old) came over to “help”. They are a lot of fun but not much help. They always want to use the clippers, but only on things like grass and the weeds I have pulled – never on the stray tree shoots that I use them on. Today they explored under my deck finding “pretty”rocks. My deck is about two feet off the ground at the highest point – certainly not much of a place to play! The neighbors on the other side also have two girls (a toddler and maybe nine years old?). The girls shout across my yard on a regular basis and remind me of when my kids were little. 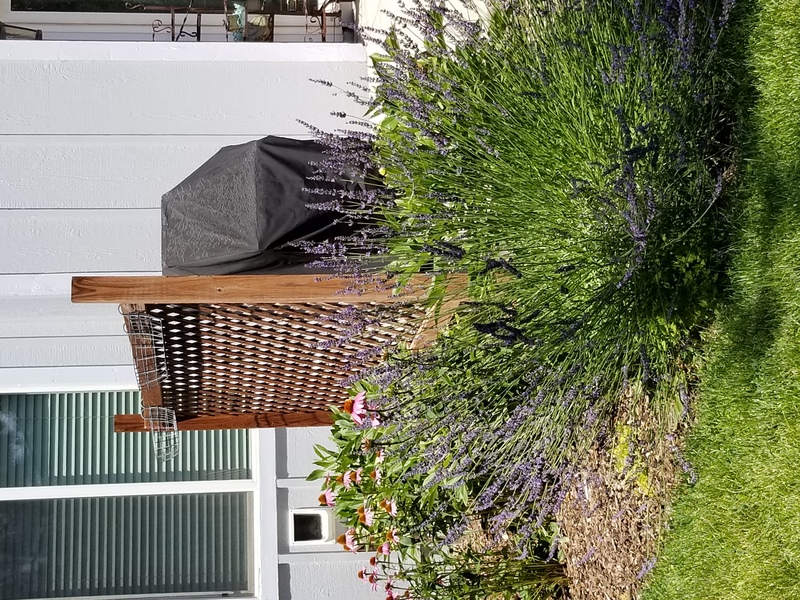 As I worked my way around the yard, I was happy to see that the lilac bushes are growing and healthy and that my oldest lavender plant is loaded with blossoms and has taken over the corner of the bed it lives in. I found a few spots where the sprinklers are just not doing the job – the question is whether I can fix it or if I’ll have to bring in expert help. I’m going to try and do some adjustments and see if it makes a difference. 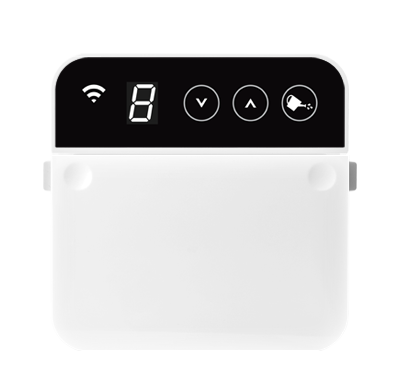 I’m more willing to try now that I changed my sprinkler controller. 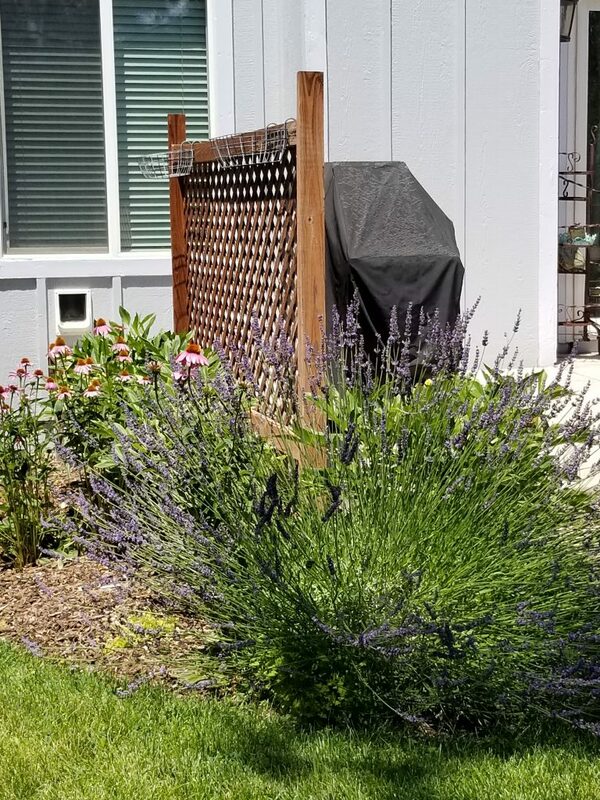 I think I posted a quick comment on Facebook, but I installed a Rain Machine this year and I really love that I can turn zones on and off with my phone. This morning the drip zone started while I was working in the yard and a couple of the emitters had come off and there was water shooting into the air. I quickly turned the zone off, replaced the emitters, and had the zone back on in no time. It is so convenient! When I was younger and we were living in Kansas in a house with a yard, I was pretty obsessed with yard work. I planned beds and added plants and did maintenance weeding and deadheading several times a week. We had huge trees and quite a bit of local animal life and if the grass was kind of yucky, the rest of the outdoors made up for it. I loved working in that yard. When we moved to Colorado we had huge flower beds in the back that were always filled with weeds. I could not keep up with that yard. There were things I loved about that yard though. We didn’t have much front yard because the house was located in the corner of a small cul-de-sac. We dug up the tiny bit of lawn on one side of the drive and made the loveliest little flower bed. 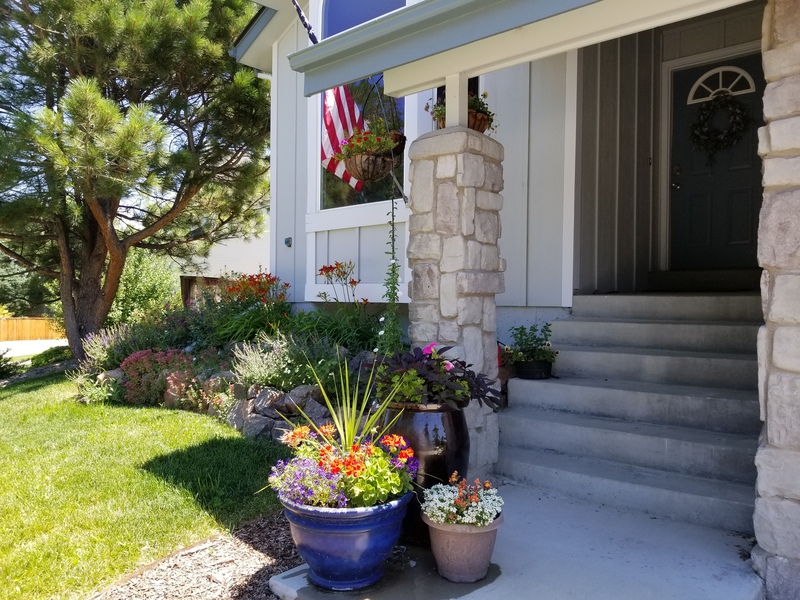 We put pots all along the front of the house (along with drip lines) so that the front had all this cheerful color during the spring and summer. In the back we had a lattice wall along one side of the deck and we hung pots on this wall as well. But I vowed that our next house would not have a ton of flowerbeds. My current yard has a front bed with perennials and two smallish beds in the back, also stocked with perennials. 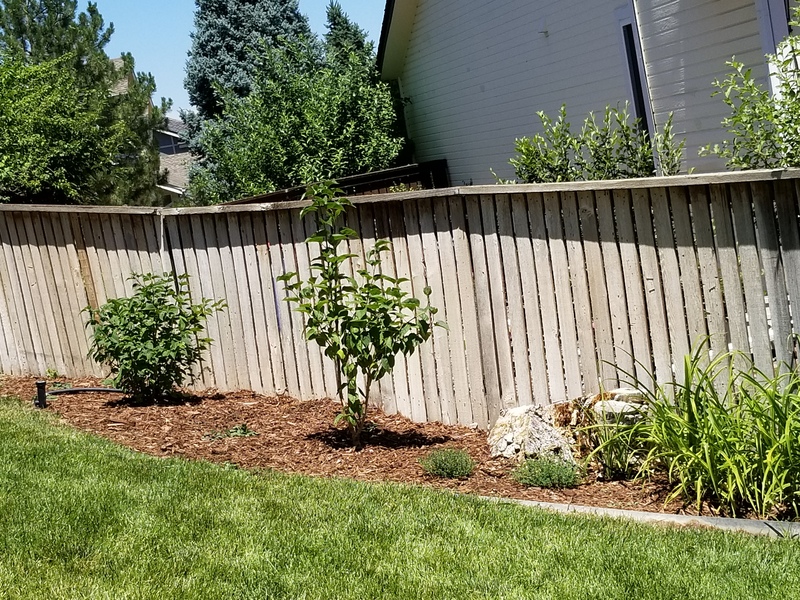 I filled part of one bed with sod this year because the soil is filled with small stones spilling in under the fence from the neighbors yard and it mostly only grew weeds. 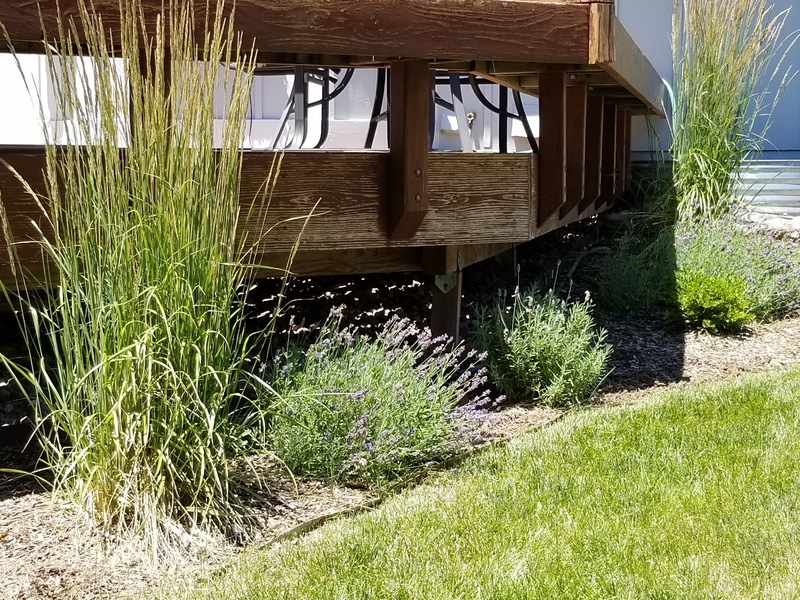 Oh, and there is a strip around the deck that I have been trying to fill up with bushes and things that don’t require a lot of upkeep. For many years being the mom was so all consuming that I didn’t put much energy into the yard. Despite all our good intentions, we never got a drip line working while Tom was alive. He had installed a valve and the hose around the yard, but there was an electrical issue that I only got resolved after he died. 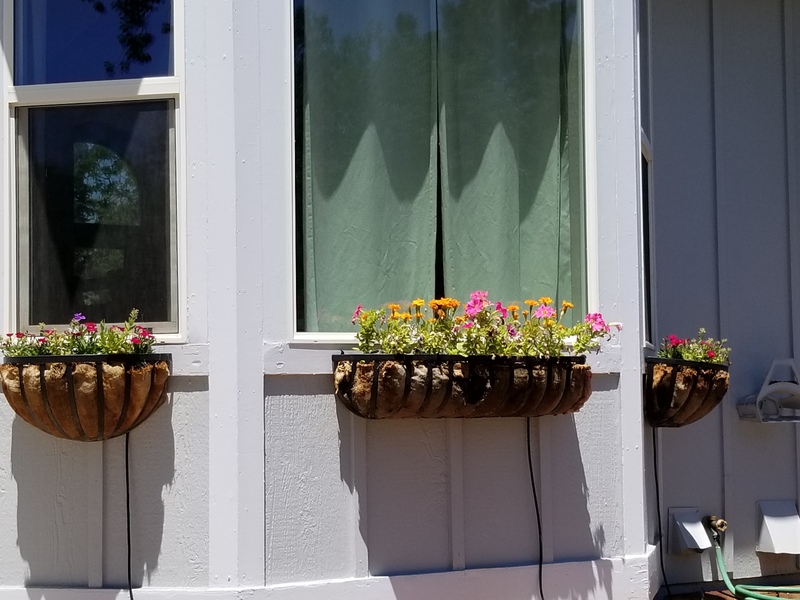 I finished the drip system with a little help from my mom and started making some attempts to grow flower pots. This year they are all just beautiful! As my life has become less stressful, I find I have a little more desire to get out and make things look good. Planting lilac bushes this year felt a little like channeling my younger self! 🙂 There is something satisfying about seeing pretty things grow and pulling weeds. But not in 90 degree weather!! At least now I can sit back and enjoy the air conditioning and some entertainment and still feel satisfied that I accomplished something today!